HulaArt is a collection of individual, unique art expressions aggregated together to create a unified installation greater than the sum of its parts, yet simultaneously modified by those discrete contributions. This collaborative art installation helped to increase the participation in art making at this year’s Salem Arts Festival (SAF). During the last four months, over 120 students, artists, and locals created unique art pieces that have been integrated into the HulaArt Canopy for this weekend’s festivities. The project design began in earnest in January after the SAF committee approved a rendering of what a hula hoop canopy over Artists’ Row might look like. The design needed to evolve at two different scales: at the macro level, over four hundred hula hoops had to span the irregular buildings of Artist Row. 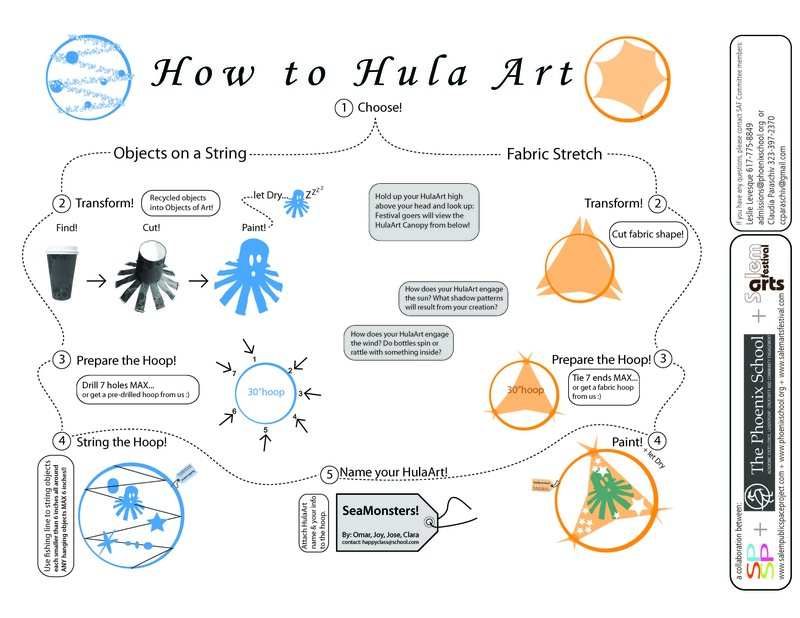 The public launch of the project at the Peabody Essex Museum’s Artopia night began a series of HulaArt workshops throughout Salem during the spring, in addition to groups and individuals that took on HulaArt unaided. HULA ART public art installation for Salem Arts Festival on Artists Row – Salem MA from Social Palates on Vimeo. After a sunny, ten hour installation, over four hundred hula hoops, a fifth of which were transformed into HulaArt, form a colorful canopy above Salem’s Artist Row. The installation was performance art when we watched people negotiate the pedestrian street paved with the hoops, acrobatic circus when two cherry pickers, several ladders, and people on the ground too lifted each of the five sections of the canopy into place, and a chance to speak to numerous people about what it was: public art, collaboration, and the upcoming Salem Arts Festival this weekend.